Learn the Excision of a sural nerve end neuroma and application of a Polyganics NeuroCapTM surgical technique with step by step instructions on OrthOracle. 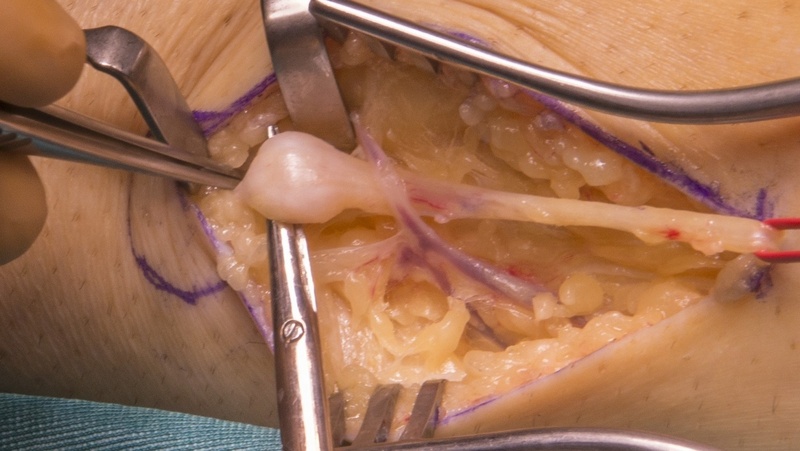 Our e-learning platform contains high resolution images and a certified CME of the Excision of a sural nerve end neuroma and application of a Polyganics NeuroCapTM surgical procedure. The sural nerve is a common donor site for autologous nerve grafting for peripheral nerve defects. It is harvested from the lower leg from the midpoint of the upper calf to the lateral ankle mid way between the posterior aspect of the lateral malleolus and the Achilles tendon. When harvested the proximal end is usually cleanly transected and left deep to the deep fascia to reduce the risk of a symptomatic end neuroma formation. In this case the patient had trauma to the right forearm following a road traffic collision and the sural nerve harvest was for reconstruction of the posterior interosseus nerve as three reversed cable grafts for extensor carpi ulnaris, finger extension and thumb extension. Three years later he represented with pain in the posterior calf worse when lying supine in bed with sleep disturbance. A diagnostic local anaesthetic block under ultrasound confirmed excellent pain reduction and he was consented for exploration and neroma resection and application of a Polyganics bioresorbable PCL NeuroCapTM.